That heady scent whisks me right back to my French honeymoon, where Paul and I ate basil, mozarella and tomato salads with most meals. J'adore le basilic. Dining on a basil-infused dinner in Paris. 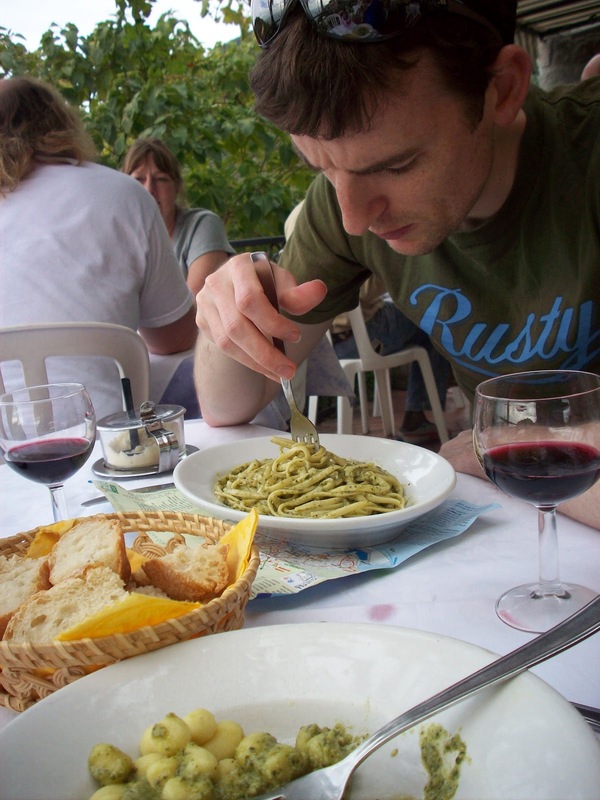 And it helps me remember the magical lunch I ate with Paul, overlooking a vineyard in Italy's stunning Cinque Terre. Eating basil pesto pasta with Paul during lunch in Corniglia. It reminds me of a dozen good Annabel Langbein recipes, like her Spinach tart and Summer cob salad. To me, basil tastes like summer. And it's growing well in my garden this summer so I finally tried my hand at making basil pesto a couple of weeks back. This was so ridiculously easy, I can't believe I haven't made it before. I used the ingredients list on my favourite store-bought basil pesto as a guide, and tried to figure out the quantities as I went. 1. Prepare ingredients and combine in a food processor, chopping until smooth. 2. Store in the fridge for up to two weeks, or freeze in ice-cube trays until needed. ... I froze the rest in baby-food freezer moulds for later use. Basil pesto is delicious in sandwiches, on crackers, stirred through pasta, in salads, in quiche, with chicken and more. It's such a versatile condiment - really worth having on hand. Freezing pesto in ice-cube trays is a great way to ensure you have access to it year-round, ready to add its magical flavour to any meal. Note: I buy my pinenuts and cashews from a bulk foods store and store them in the freezer to keep them fresh until I'm ready to use them. This is because the oil in nuts goes rancid if left at room temperature for too long. Post shared on Sunday School Blog Carnival and Freaky Friday. first, jealous of your fabulous honeymoon! second, great idea to freeze the pesto. I agree that basil smells like summer, mine is growing well too (unusually) and I have been putting it in everything :) I shall make some pesto as soon as I get some more nuts (I used macadamia nuts as they're always cheap around here). Also like the ACV, I am running out of frozen lemon juice! Lucky you, with the cheap macadamias. I love them, but they're so pricey here. And yay for your basil. I love getting a good crop of SOMEthing, whatever that may be. It helps me plan some good meals. My zucchinis are doing well. I think I might be stocking enough in the freezer to last till next summer. Maybe. Fingers crossed. Whoops! Thanks for pointing that out Jennifer. I've updated it to say 1/2 cup. Cheers! I make pessto here in New Zealand....by the BUCKETLOAD. Honestly. I'm JUST about to take in a washing basket full of basil...and I'll probably make about 4 kilos of pesto ....that takes ne an hour. It'll be gone withing two months though....Greedy teeneager! I freeze it WITH the cheese....no problem ! To 'extend' the basil.....make half and half with spinach////or anything green really ! I use almonds.....much cheaper....and for the kids lunch pesto...I often use PEANUTS. They can't taste the differeence ! You can also make lovely pesto from good old PARSLEY.